Special update: The Panasonic 42.5mm ƒ/1.7 was awarded a Lens of Distinction in the Best Prime Lens category of our 2015 Lenses of the Year awards! The Panasonic 42.5mm ƒ/1.7 ASPH POWER OIS LUMIX G lens was announced in February of 2015, and hit store shelves later that year in May. With its fast aperture speed of ƒ/1.7 and effective field of view of 85mm (in 35mm film terms, thanks to Micro Four Third's 2x crop multiplier), the lens is aimed squarely at portrait shooters. The lens is compatible with Micro Four Thirds bodies, ships with a round lens hood and is available now for around $400. Our testing shows the Panasonic 42.5mm ƒ/1.7 to be extremely sharp - as in, practically tack-sharp from its widest aperture of ƒ/1.7. It stays sharp until diffraction limiting sets in at ƒ/8, but you probably won't notice any reduction in sharpness until ƒ/16, and only then if you have particularly sharp eyes. At ƒ/22 there is a generalized softness across the entire frame, but even then, it's almost negligible. Again, according to our test results, chromatic aberration is kept well in control across all apertures. We do note some purple fringing in areas of high contrast when the lens is used at ƒ/1.7, but it's not excessive. When the lens is used at ƒ/1.7, the corners will be a half-stop darker than the center of the image; at any other setting, corner shading is negligible. There is a trace amount of barrel distortion (+0.1%) in images shot with this lens, but it is barely perceptible, and if you truly need your straight lines straight, easily correctable in most image processing software. Autofocus on the 42.5mm ƒ/1.7 is powered by a stepping motor system, which focuses very quickly and quietly. In our tests, we found it to be very fast and accurate, taking well under one second to rack from minimum focusing distance to infinity, with no hunting for focus needed. Attached 37mm filters won't rotate on the lens during autofocus, which is always nice. Of course, this lens supports manual focusing as well, and it's a pleasure to use, with a nice, wide focus ring that's very smooth to rotate. The focus ring is electronic, and not a mechanical focus system seen on your typical DSLR lens; this means that the ring can rotate forever (no hard or soft stops at minimum focus and infinity). Since it's electronic, how quickly you rack focus between near and far-away subjects depends on how fast or how quickly you accelerate the rotation of the focus ring. You can focus very precisely with small, slow rotations or quickly rack through the range with faster rotations. The lens isn't designed for macro work, but with its 0.2x magnification and close-focusing range of 31cm (just over a foot), it's not bad in this regard. The 42.5mm ƒ/1.7 is very lightweight at just 130 grams (just over 4 ounces). 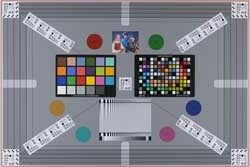 The lens features 10 elements in 8 groups, including 1 aspherical element, and seven rounded diaphragm blades make up the aperture for nice background blurring. It is pretty svelte in its design -- there are no buttons, indicators or scales. The only point of operation is the manual focus ring. There is a 37mm thread for filters, and a bayonet mount for the included round lens hood. The lens also comes with a removable decorative ring, which attaches to the bayonet mount, when the hood is not in-use. This ring is great for getting lost, though, so it's probably easier to just remove it and keep the hood on instead. The manual focusing ring has a plastic ribbed texture and is a generous 3/4'' wide. The ring will turn forever in either direction, not being limited at the infinity or close-focusing distances. The front element does not turn during auto or manual focus. The lens features image stabilization, though Panasonic makes no claim on its performance. In our testing, we see about two and a half stops of hand-holding improvement; see our IS Test tab for more detail. It's slightly less sharp, and chromatic aberration is just slightly more evident, and it doesn't feature image stabilization; however, the Olympus bodies feature sensor-shift stabilization, making this feature moot. If you absolutely need the extra light-gathering ability of a ƒ/1.2 lens, then this is the lens for you - at four times the price. With super sharp results, a small package and a low price point, what more can you want? For portrait shooters in the Micro Four Thirds mount, this is an excellent lens. Excellent image quality wide open, good build quality, looks good, image stabilization, fast autofocus, compact and lightweight. This is a sweet little lens. Compact, lightweight and with quick and silent autofocus. It delivers excellent contrast and sharpness at its widest aperture and it even gets a little better when you stop it down. The bokeh looks fine to me and I dont mind the vignetting. There's nothing more I could ask for in a lens in this price range. 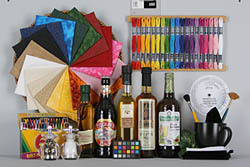 Just check out the still life shot here on Imaging Resource. It beats the Olympus 45mm f/1.8 and as an added bonus you get image stabilization and a lens hood. The Panasonic 42.5mm can focus pretty close too. I think this is a very versatile and desirable lens and thats why it has replaced my Olympus 45mm f/1.8. 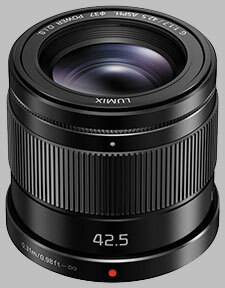 There is of course the Panasonic 42.5mm f/1.2, which is even better. Its also much bigger, heavier and very expensive. Does not focus anywhere near as close as people claim. It is quite disappointing in this respect. Overall I think this lens is a keeper, it's small, light great build and optical quality. But it does not focus anywhere near as close as people claim. It is quite disappointing in this respect. For example the Fuji 18-135mm zoom lens focuses far closer than this lens does. I think that this lens is better than the Olympus 45mm f1.8 lens and I had both. Note! I have since sold my M 4/3rds system. SLR Gear review is dead on. It's a great lens. No aperture ring, OIS mechanism rattles when powered off. This lens is an absolute gem - super sharp, OIS, small, light - a bargain short telephoto prime with decent close focus abilities. Optically, it's excellent and my sample tests the same as SLR gear's review so it seems build quality might be reliable too, although the clanky rattle of the OIS when powered off is a little disconcerting. The close focus and focal length makes this lens suitable for use with extension tubes to do macro shots about 24mm wide and still keep a reasonable working distance for lighting. The 37mm filter thread means a very small lens cap which is a little fiddly with the vanity ring on the front so it's much easier without. I also have the Leica-designed 15mm with an aperture ring so I wish this lens had an aperture ring too, but considering the price and overall quality, I can't complain. I got a grey import for US$300 and I expect that price might drop a little more in time making this lens a real bargain.